Day 2 of the Moab trip saw the painters go off to Arches National Park, which doesn’t permit ATVs or side-by-sides. (See here for Day 1) So, Todd Vandyke, husband of one of the painters, joined me for a Polaris RZR ride to the west and south of Moab. 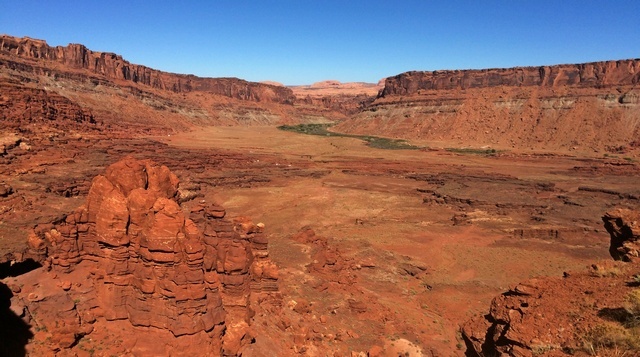 We picked the Hurrah Pass Trail, immediately followed by the Chicken Corners Trail, as outlined in ATV Trails Guide, Moab, UT, by Charles A. Wells (ISBN 978-0-9664976-7-0). Wells properly lists the trails as “easy,” but they had enough interesting features that we were glad we were in a RZR rather than my Prius. The trail starts at the southwest end of Kane Creek Road (N38° 32′ 4.37″, W109° 36′ 1.25″). There’s a staging area that charges $2 to park. We dutifully parked and paid. As soon as we got on the trail, we saw another parking lot just a few yards further that cost nothing for parking! I suppose our $2 did someone some good. 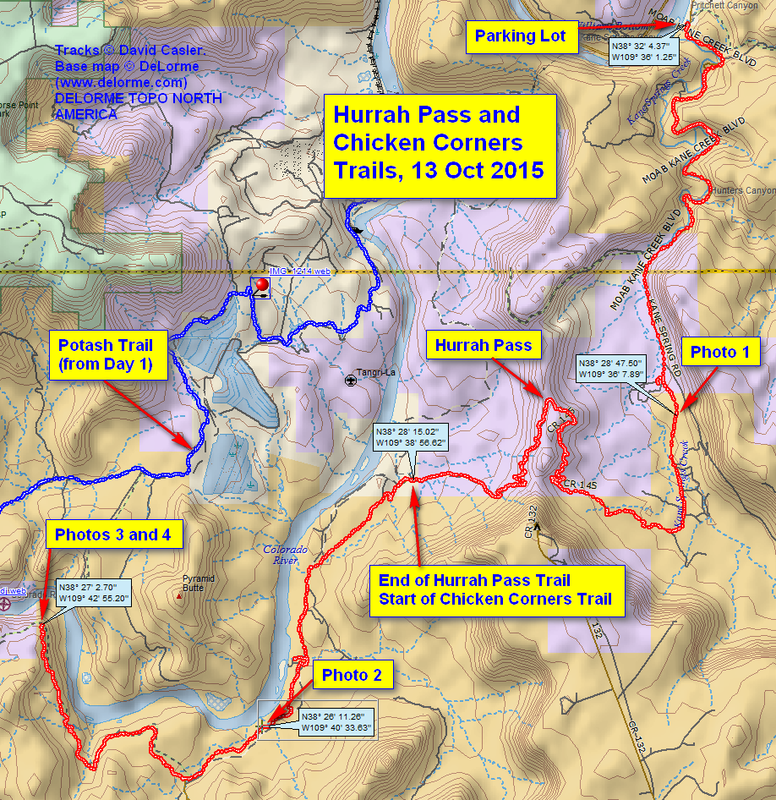 The GPS track for both the Hurrah Pass and Chicken Corners is shown at the bottom of this post. Every inch of the trail has spectacular scenery. The trail goes pretty much due south (with many switchbacks) for almost 7 miles. I took Photo 1 as we were going down this road. Looking approximately west from the location shown on the map. It’s hard to see in this small photo, but in the distance is the Colorado River. For those who love red rock, this is a feast! Photo by Dave Casler, taken from 38° 28′ 47.23″ N, 109° 37′ 35.96″ W.
We then headed west, then up over the wiggly road to Hurrah Pass. From below, you can’t even tell there’s a road. The road winds around and finally goes over the “pass,” (more a low spot between the upthrust rocks), and then wiggles down the other side. Some more traveling got us to the intersection with an advanced (meaning rough) trail that goes north for awhile. Wells marks this as the end of the Hurrah Pass trail and the beginning of the Chicken Corners trail. (My coordinates for this point are N38° 28′ 15.02″, W109° 38′ 56.62″, very similar to Wells’s reading.) From here the trail climbs up and runs along a sort of shelf with great views of the Colorado River. Photo 2 looks approximately north and shows some wetlands and a sandy beach. Photo 2 looks approximately north at the Colorado River. Photo by Dave Casler, taken at 38° 26′ 11.37″ N, 109° 40′ 33.61″ W.
We headed on, now along and above the river. Photos 3 and 4 were taken at Chicken Corners, I presume so named because if you’re chicken, you won’t look out over the river. I’m not chicken, as the photos prove, but I did stay several feet back from the edge. The drop to the river is essentially vertical. Photo 3 is a panoramic from east to west centered about on north. Photo by Dave Casler, taken at 38° 27′ 2.71″ N, 109° 42′ 54.65″ W.
The trail continues on, but we opted to make this our terminus. Again the views were spectacular. The GPS track is shown below (this time on a DeLorme Topo North America background because it shows more detail). If you’d like the GPX file itself, you can click here. GPS trail of our travels along Hurrah Pass trail and Chicken Corners trail, shown in Red. The blue track on the other side of the river is Day 1’s track. This entry was posted in All-Terrain Vehicles (ATV) and Side-by-Side, Utah and tagged Chicken Corners, Hurrah Pass. Bookmark the permalink. Great pics but picture 4 was taken on the way up to Hurrah Pass from Kane Creek/Springs Canyon. You picked a gorgeous day to take photos of such a picturesque area Dave. Great job !! !